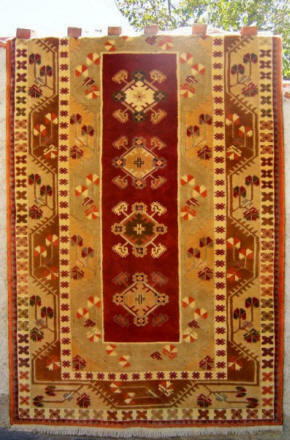 Comments: A medium large carpet incorporating several of the traditional designs from the Milas region of Turkey. The center panel is in a subdued maroon with unusual stylized motifs. Many of the motif borders were outlined in black when the carpet was made, during the cleaning and finishing process the black pile was cut back by hand to form a 'valley', giving the motifs and borders a three dimensional look. The full design, including the black outlines can be seen on the reverse side.